Jalen Ramsey Is the Best Cornerback in Football. Now What? JACKSONVILLE — Darrelle Revis officially ended his Hall of Fame career last week. It had been a while since Revis Island was the most well-known and feared land mass in the NFL, and the league hasn’t seen anything like it since: a true shutdown corner who could operate at an elite level no matter the defensive scheme. Revis’s retirement sparked nostalgia for the days when a singular talent could shut down one side of the field and dominate the league. Following his stellar second NFL season, Jalen Ramsey got more involved with his branding. He populated his Instagram with professionally finished photographs. He incorporated his own logo—his initials side-by-side, stylized in the shape of a football. This summer, when asked who was on his NFL Mount Rushmore, Ramsey borrowed a Drake lyric and stated: “My Mount Rushmore is me with four different expressions.” Then he went out and sold t-shirts with his personal “Twentyland” brand embossed on the front. The “T” is a palm tree, meant to evoke the image of an island. In other words, the 23-year-old Jaguars star thinks the search for the heir to Revis Island has gone on long enough. This is what you do when you’re the best. You market yourself as the best. You proclaim yourself as the best. It can be the best part of being the best. Ramsey is so good at what he does that he doesn’t have to get too into the weeds with the defensive gameplan. Give him his assignment and, more times than not, he will lock down his receiver. Ramsey’s interviews range from brash to even sassy at times, but there’s no hint of arrogance when he says this. It’s a stare-straight-ahead confidence that his teammates and coaches know is true, and it’s evidenced by quarterbacks struggling to a 55.5 passer rating when targeting him last season. It’s why Ramsey’s weekly film sessions have little to do with defensive coordinator Todd Wash’s gameplan and more about an opposing receiver’s tendencies. By most metrics, Ramsey is the best cornerback in the NFL today. He earned more first-place All-Pro votes from media covering the league than any other cornerback in 2017. But Ramsey is not an island. Not yet anyway. He needs to string together another season or two of dominance before truly earning that title. He’s well on his way. Since being drafted fifth overall in 2016, Ramsey has spent his career climing to the top. Now that he’s there, what’s next? Ramsey’s offeseason was fueled by the way last season ended. In an alternate universe he could be Super Bowl LII champion Jalen Ramsey. Instead he’s just AFC title game participant Jalen Ramsey, yet another victim of a magical Tom Brady comeback. In Foxboro last January, the Jaguars were 12 minutes from the Super Bowl, leading the Patriots 20-10 with Brady’s offense pinned at its own 15. In their first 18 games last season, Jacksonville had given up one fourth-quarter lead all season (they coughed up a one-point lead at Arizona in Week 12). But facing a Patriots offense that had lost Rob Gronkowski to a concussion earlier that afternoon, the Jaguars transitioned from man defense to zone coverage in the fourth quarter. Brady found the soft spots, going 8-for-10 for 120 yards on two scoring drives, both ending with Danny Amendola touchdowns, in the 24-20 win. That was in the heat of the moment, minutes after the game. Asked five months later about whether he still felt that the biggest reason they gave up the lead was the switch to zone, he wiggled in his chair inside EverBank Field’s US Assure Club before answering. Ramsey dominates as a press-man corner. At 6' 1" and 209 pounds and with 33 3/8-inch-long arms, he can jam just about any receiver at the line. On average he was .84 yards away from a receiver when the receiver caught the ball, ranking third in the league according to NextGen stats. His 5.6 yards per target allowed was third-best in the NFL. His 19 pass breakups last season were second-best. He’s an excellent cornerback in any system, but Ramsey is clearly at his best in man coverage. Looking specifically at his play against routes within 9 yards of the line of scrimmage, he allowed a league-low 3.56 yards per target and just 2 yards after the catch, according to Pro Football Focus. But Ramsey and the rest of the Jaguars played it safe in the final quarter against the Patriots, and that decision might be among the reasons Jacksonville isn’t the reigning AFC champs. “A lot of it is, you’ve got to give credit to Tom Brady. He’s the best quarterback in the league,” defensive coordinator Todd Wash says. “The first thing you do as a coach after a win or a loss is ask, What could I have done better? I could have made some different calls to maybe put our players in position to make plays. And I’m sure our players will say, ‘Hey we should have made plays.’ It wasn’t just one or two things. Being so close, and losing in that fashion, made Ramsey want to get away from football for a while. He had to be convinced to attend the Pro Bowl by “my peoples,” meaning his family and agent David Mulugheta. Playing in the Pro Bowl helped take some of the sting away, and then he set out on an offseason program built to ensure that he wouldn’t feel this sting again. Lamont Ramsey doesn’t want anyone to know the secrets of the workouts he puts his son through. A trained EMT with a bachelor’s degree in health sciences, Jalen’s father has been training his sons—and now his grandsons—since they were kids. 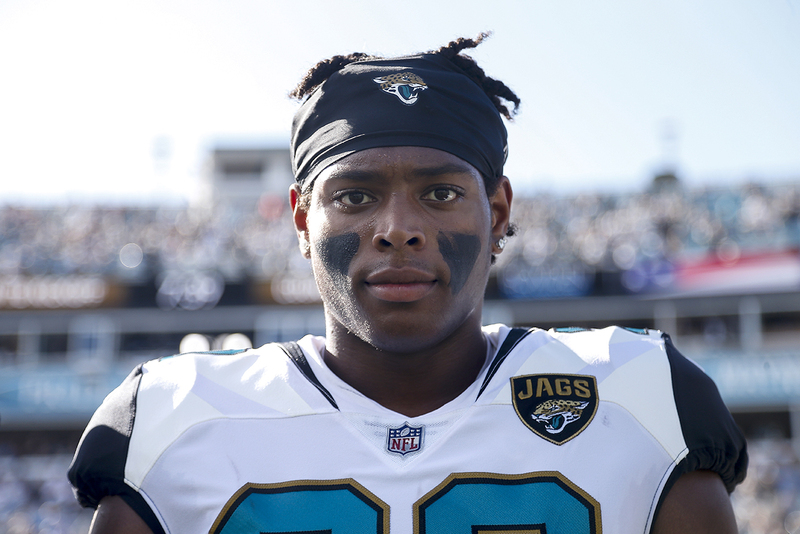 Jalen Ramsey spent his offseason working out with his father in and around his hometown of Smyrna, Tenn. He missed minicamp his rookie season after having surgery to repair a tear in the meniscus in his right knee. Last June he had surgery for a sports hernia, missing that year’s minicamp, too. This offseason, he and his dad wanted to “get back to the basics” while making sure he would avoid another pre-training camp surgery. Despite his coyness, Lamont eventually offered up what he worked closely with his son on in the spring and summer. Jalen is long and strong enough to dictate what a receiver can do in man coverage, but Lamont wanted to “refine some of his movements when he’s off the ball.” If Jalen is going to be playing off his receiver in the Jags’ scheme, Lamont wanted to “make sure his movement skills are intact so that he can go either way.” The two worked on Jalen’s explosive transition from a backpedal to running forward without wasting motion, avoiding the exaggerated step when transitioning that can plague taller corners. “Whatever the coach thinks will be best for the team to win, he should do, and that’s why Jalen just has to be prepared to play any way they want him to play,” Lamont says. “That’s my job, to help him be ready to play any way. If they tell him to play off, he’s going to be off and he’s going to be good at it. They say you’re going to press, then be good at that. Those workouts near Nashville were done in lieu of voluntary workouts in Jacksonville. Ramsey opted against being at the team facilities for voluntary offseason training activities for two reasons: (1) to be closer to his pregnant girlfriend Breanna Tate, a former college track star at Ole Miss and sister of Lions receiver Golden Tate (they welcomed their baby girl this week, and Ramsey announced he will join the Jaguars camp when he’s comfortable knowing his family is happy and healthy); and (2) he wanted to be with his oldest and most familiar trainer: his father. Both sides said the right things about Ramsey’s OTA absence. (Look to New England to see how a preferred trainer versus a strength staff tug-of-war can play out.) Jaguars head coach Doug Marrone said he trusted what Jalen was doing in Tennessee but that they would ease him in during mandatory minicamp. The Ramseys promised they were in constant communication with Jacksonville throughout. No teammate spoke out against Ramsey working away from the facilities. Still, it’s difficult to imagine Tom Coughlin, the old-school coach who is now the Jaguars czar, was thrilled about his star corner being away for any voluntary period of time in today’s NFL, when offseason time for players and coaches to work together seems to dwindle each season. And it’s impossible to ignore the fact that, while more players appear to be skipping voluntary workouts, you’d be hard-pressed to find one missing workouts with only two NFL years under his belt. The positive for the Jags is that his absence from voluntary work wasn't contract-related. His rookie deal will run through 2020 once Jacksonville picks up his fifth-year option following this season, and at some point within the next two years, should all go to plan, he will become the highest-paid cornerback in NFL history. Expectations are high for a Jaguars team that seems to have its formula figured out. Run the ball to open up the passing game, dominate in the trenches on both sides of the ball, suffocate the opposing offense with a fast, physical, ball-hawking defense. Jacksonville just had its first winning season since the Bush Administration, and after trouncing Pittsburgh twice and taking Brady and Co. down to the wire in Foxboro, they figure to be an AFC contender in 2018. If that’s the case, if the Jaguars put together consecutive winning seasons for the first time since 2004-05, we could be looking at the next dynastic defense, especially in the wake of the dismantling of the Legion of Boom. Last year, Jacksonville’s defense ranked in the top five in: points allowed, yards allowed, turnovers created, first downs allowed, completions allowed, passing yards allowed, passing touchdowns allowed, interceptions, and opponents average time and average number of plays per drive. Part of Seattle’s undoing—along with the requisite aging, contract extensions and injuries—was the years-long feud between the offense and defense, as chronicled in last year’s ESPN report. One great football unit can get the feeling its inferior counterpart is keeping it from greater heights. Ramsey saw this sort of in-fighting often during his championship-winning season at Florida State, where fights between the offense and defense happened “every week,” he says. But he doesn’t see anything like that happening in Jacksonville, even though his prolific trash talk finds it way onto the field at practice. The Jaguars defenders don’t need the offense to get into scuffles when they have each other. Late last season, Jimmy Garoppolo and the Niners lit up Jacksonville for 125 yards in the first quarter, starting off a 44-33 drubbing. Lineman Malik Jackson and (now former Jaguar) cornerback Aaron Colvin mixed it up during the quarter break and had to be separated by multiple teammates and coaches. These sibling rivalries pop up all over Jacksonville’s defense. Along the defensive line, Jackson, Calais Campbell, Marcell Dareus and Yannick Ngakoue regularly battle over who’s the best pass rusher. In the defensive backs room, Wash hears the constant jawing between Ramsey and fellow corner A.J. Bouye about who’s the top dog. Undrafted out of Central Florida in 2013, Bouye turned a stellar 2016 season with the Texans into a five-year, $67.5 million deal with the Jaguars. He had a team-leading six interceptions last year (two more than Ramsey) and was named second-team All Pro. Bouye’s list of top cornerbacks in the NFL begins with himself and is followed by Ramsey, Casey Hayward, William Jackson and Marshon Lattimore. To no one’s surprise, his teammates and coaches aren’t willing to definitively say who’s the better Jaguars corner. “I think I got 1A and 1B,” Wash says. “You ain’t gonna get that answer outta me,” Gipson laughs. Of course, Ramsey believes he’s the best. He has the stats, the accolades and the votes to back it up. This is what Ramsey has spent years training for with his father, and he’s at the top before his 24th birthday. “This is truly what I expect of myself. It’s what my loved ones and my teammates expect of me. It’s honestly what’s needed of me to help this team be successful. That’s how I look at it. There’s a phrase that gets tossed around the Jaguars locker room. “It’s easy to be great, but it’s hard to stay great.” That’s the next challenge for Ramsey.